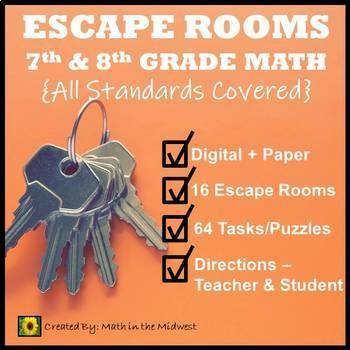 Looking for a great way to get students engaged and excited about practicing the 7th and 8th grade math standards? LOOK NO MORE! This bundle will engage your students and they will even enjoy doing math! Plus there is NO PREP all you need is an internet browser as well as either a laptop, Chromebook, iPad, tablet, or desktop. 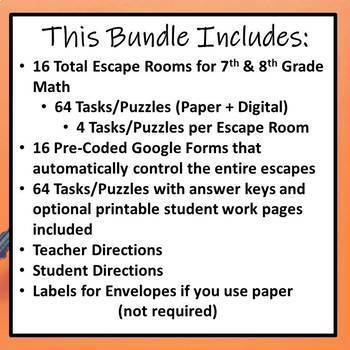 This bundle inculdes my 8th Grade Math Escape Room Bundle and 7th Grade Math Escape Room Bundle. 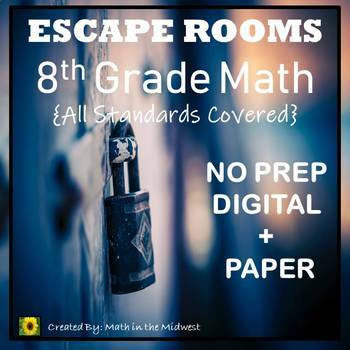 There are 16 Total Escape Rooms for a total of 64 Puzzles/Activities. Listed below are all of the escape rooms included. Be sure to check out the preview for a detailed overview of everything that is included.